New year brings new beginnings, new plans, and with those, new styles, new trends -- and of course, new colours. This doesn’t mean you have to repaint all the walls and replace all the soft furnishings, but if you are planning to redecorate or want to buy some new interior items, knowing the trends might help you make a decision. Pantone’s colour of the year for 2019 is Living Coral, also known as Pantone 16-1546. It is a pink, but warm, peach-like, with a strong hint of orange and even a golden undertone. It is optimistic, lively, yet somehow intimate and could work well both in textile or ornamental accents, pieces of furniture as on whole walls or even in whole rooms (perhaps a hall or a bathroom). 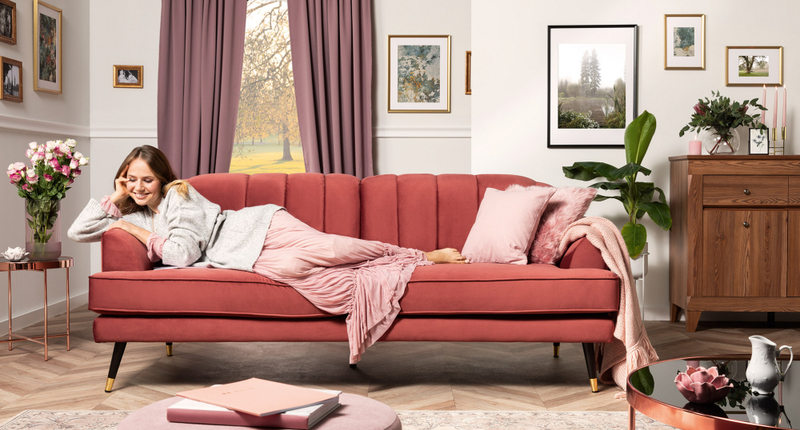 Other designers are also focusing on warmer varieties of pink, blush, dusty pink and generally warmer versions of the hues that came on the stage few years ago and were commonly known as Millennial Pinks. Want to update a tired expanse of beige or cream? Splash some Living Coral against it. If any variety of pink makes you cringe, don’t despair. Jewel hues that ruled in 2018 are still going strong, as are more muted greens and navies. Deeper greens in particular are having their moments. PPG, an American paint company, has announced Night Watch -- a deep, jade-like shade of green to be their colour of the year, while various interior designers are singing praises of sultry hunter greens, bottle greens and emeralds. All those green choices speak to our need to connect to living nature and all things timeless and gender-neutral. Darker greens combine beautifully with natural materials (wood or undyed fabrics) as well as with neutral colours in a wide variety of shades. If a whole room in such a deep shade is too much, and you don’t want to remodel your whole fitted kitchen, consider small yet high impact ways to introduce the color in, for example, a rug, an accent wall, window treatments or a new sofa. UK’s Dulux announced Spiced Honey as its Colour of the Year for 2019. A warm, paler amber hue, different in style but with a vibe similar to the Pantone’s choice, has apparently been chosen to evoke a positive and optimistic mood -- and don’t we all need that? The professional interior designers are replacing stark whites and greys, especially on the floors, with warmer neutrals and nudes in shades of mushroom, birch, sand and pale oak. Such floors reflect more light and are available as wood, stone, vinyl or carpeting. An even sweeter trend is visible in some designers going back to retro-ish pastels, from softest pinks and duck-egg blues to pale sage and pistachios, everything here is softer, brighter and washed out with milk rather than water.